There are still plenty of gorgeously bright coloured rowan berries on our local trees here in windy, rainy Lincolnshire, and it has become a bit of a tradition to pick a fresh load each year and string them into charms to guard windowsills, doors and chimneys – very much a long standing tradition around Britain and Scotland, in fact, as the old Rowan Berry and red thread charm attests! This year saw a basket with a whole four bunches sitting on the kitchen table for a couple of weeks until I had time to thread them up, but at last time time came, and instead of threading them onto wire, as I usually do, this time I decided to thread them up into long ropes, which, as they dry, will keep their colour and can be used to decorate autumn garlands, hang around the Yuletide tree or hang above doors, with smaller seasonal tokens suspended off them. 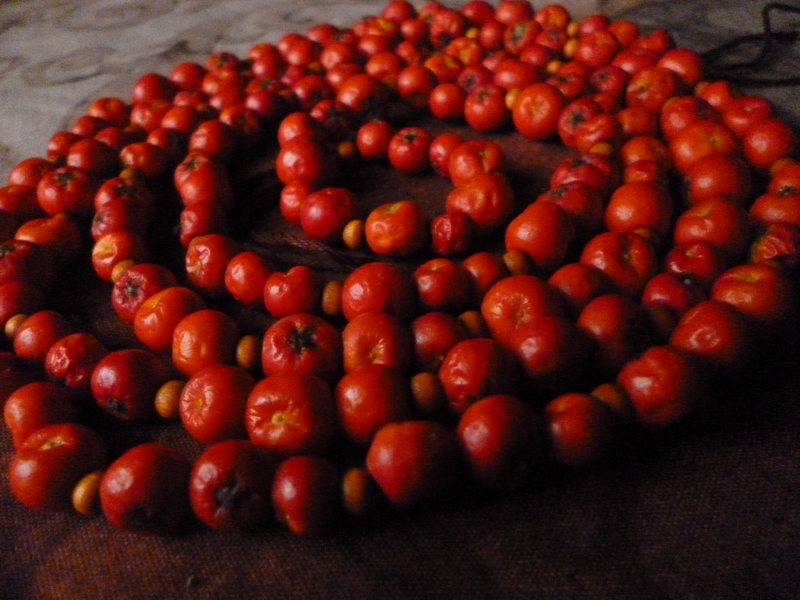 One of three completed rowan berry and wooden bead garlands – a labour of love, but so well worth it! They look beautiful. These are very easy indeed to make! Take some time to remove each berry from the central stalk, and discard any blackened or manky looking ones – they don’t tend to dry as well, and mouldy berries don’t look very nice on the garland! 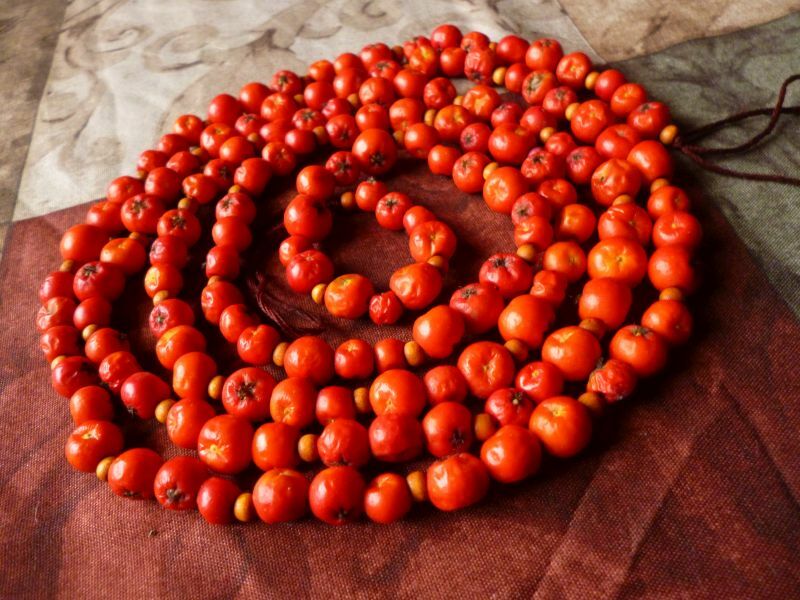 I threaded mine up with some small wooden beads, which can be found in most bead shops and also in some craft stores, but you could also tie a knot between each berry if you wanted to. You will need some red embroidery thread – plenty of it – and and a long, fairly thick needle with a large enough eye to thread the embroidery yarn through. Finally you will need an ample store of patience, as this is slow work, but so very worth it! Look at those little beauties! Tie a loop in the end of your red thread, making sure you cut a good, long length – you can use this to hang it by later on if you need to. Thread the needle, and draw the red thread until it is doubled up by about a third. This makes it easier to work with, and I found it reduced the likelihood of it getting tangled up as I went! Thread on one small wooden bead. Pick up the first berry and turn it side on, then push the needle carefully through it, as close to the centre as you can so that when it dries, it keeps its strength. I like to thread mine with the little black protective star in the centre facing upwards, instead of pushing the needle through the centre of it, but its entirely up to personal preference. Repeat this process with two more berries, then add another small wooden bead. You could use red glass beads, or gemstones with particular significance if you can get them with a large enough central drill, or just have a continuous string of red berries if you prefer! Once you have got the chain as long as you want, tie another loop in the free end to finish the rope off with, and also to hang it by. I ended up with three very long ropes of rowan berries using this method, which are currently draped in my kitchen, drying out. They add a welcome splash of bright, autumnal colour to the kitchen, and once they have dried down, I shall brush them with a little copper and russet metallic paint to give them a warm tone, then tie on groups of cinnamon sticks to make natural Yuletide garlands! This is so beautiful! I wish they grew here, I would totally do this. Thank you for sharing…..so lovely! I have tried three times to grow a Rowan tree in my garden with no luck. (I am in faraway Virginia). You are fortunate to have them all around you.